A number of words have been suggested as sources for the term "cricket". In the earliest definite reference to the sport in 1598 it is called creckett. One possible source for the name is the Old English cricc or cryce meaning a crutch or staff. In Samuel Johnson's Dictionary, he derived cricket from "cryce, Saxon, a stick". In Old French, the word criquet seems to have meant a kind of club or stick. Given the strong medieval trade connections between south-east England and the County of Flanders when the latter belonged to the Duchy of Burgundy, the name may have been derived from the Middle Dutch krick(-e), meaning a stick (crook). Another possible source is the Middle Dutch word krickstoel, meaning a long low stool used for kneeling in church and which resembled the long low wicket with two stumps used in early cricket. 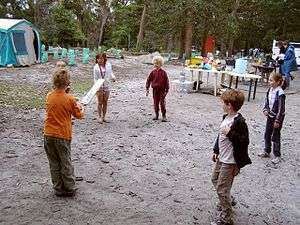 According to Heiner Gillmeister, a European language expert of Bonn University, "cricket" derives from the Middle Dutch phrase for hockey, met de (krik ket)sen (i.e., "with the stick chase"). Dr Gillmeister believes that not only the name but the sport itself is of Flemish origin. Cricket can definitely be traced back to Tudor times in early 16th-century England though there have been a number of claims, many of them spurious and/or lacking evidence, supporting earlier dates from 1301. The earliest definite reference to cricket being played comes from evidence given at a 1598 court case which mentions that "creckett" (sic) was played on common land in Guildford around 1550. The court in Guildford heard on Monday, 17 January 1597 (Julian date, equating to the year 1598 in the Gregorian calendar) from a 59-year-old coroner, John Derrick, who gave witness that when he was a scholar at the "Free School at Guildford", fifty years earlier, "hee and diverse of his fellows did runne and play [on the common land] at creckett and other plaies." It is believed that cricket was originally a children's game but references in 1611 indicate that adults had started playing it and the earliest known organised inter-parish or village cricket match was played around that time. In 1624, a player called Jasper Vinall died after he was struck on the head during a match between two parish teams in Sussex. During the 17th century, numerous references indicate the growth of cricket in the south-east of England. By the end of the century, it had become an organised activity being played for high stakes and it is believed that the first professionals appeared in the years following the Restoration in 1660. A newspaper report survives of "a great cricket match" with eleven players a side that was played for high stakes in Sussex in 1697, and this is the earliest known reference to a cricket match of such importance. The game underwent major development in the 18th century. Betting played a key part in that development with rich patrons forming their own "select XIs". Cricket was prominent in London as early as 1707 and, in the middle years of the century, large crowds flocked to matches on the Artillery Ground in Finsbury. The single wicket form of the sport attracted huge crowds and wagers to match, its popularity peaking in the 1748 season. Bowling underwent an evolution around 1760 when bowlers began to pitch the ball instead of rolling or skimming it towards the batsman. This caused a revolution in bat design because, to deal with the bouncing ball, it was necessary to introduce the modern straight bat in place of the old "hockey stick" shape. The Hambledon Club was founded in the 1760s and, for the next twenty years until the formation of Marylebone Cricket Club (MCC) and the opening of Lord's Old Ground in 1787, Hambledon was both the game's greatest club and its focal point. MCC quickly became the sport's premier club and the custodian of the Laws of cricket. New Laws introduced in the latter part of the 18th century included the three stump wicket and leg before wicket (lbw). The 19th century saw underarm bowling superseded by first roundarm and then overarm bowling. Both developments were controversial. Organisation of the game at county level led to the creation of the county clubs, starting with Sussex in 1839, which ultimately formed the official County Championship in 1890. Meanwhile, the British Empire had been instrumental in spreading the game overseas and by the middle of the 19th century it had become well established in India, North America, the Caribbean, South Africa, Australia and New Zealand. 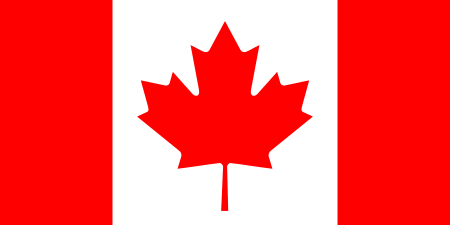 In 1844, the first-ever international match took place between the United States and Canada. In 1859, a team of English players went to North America on the first overseas tour. The first Australian team to tour overseas was a team of Aboriginal stockmen who travelled to England in 1868 to play matches against county teams. 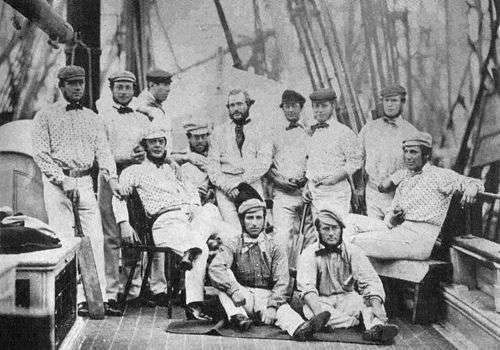 In 1862, an English team made the first tour of Australia. 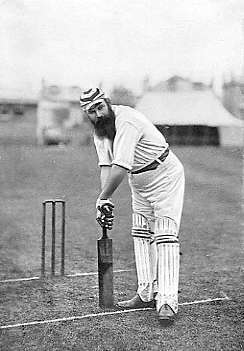 The most famous player of the 19th century was W. G. Grace, who started his long and influential career in 1865. In 1876–77, an England team took part in what was retrospectively recognised as the first-ever Test match at the Melbourne Cricket Ground against Australia. The rivalry between England and Australia gave birth to The Ashes in 1882 and this has remained Test cricket's most famous contest. Test cricket began to expand in 1888–89 when South Africa played England. 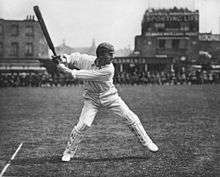 The inter-war years were dominated by one player: Australia's Don Bradman, statistically the greatest batsman of all time. Test cricket continued to expand during the 20th century with the addition of the West Indies, India and New Zealand before the Second World War and then Pakistan, Sri Lanka, and Bangladesh in the post-war period. 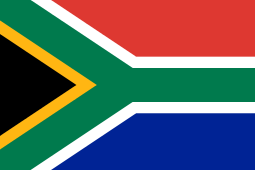 South Africa was banned from international cricket from 1970 to 1992 because of its government's apartheid policy. Cricket is a bat and ball game, played between two teams of eleven players each. One team bats, attempting to score runs, while the other bowls and fields the ball, attempting to restrict the scoring and dismiss the batsmen. The objective of the game is for a team to score more runs than its opponent. In some forms of cricket, it is also necessary to dismiss the opposition in order to win the match, which would otherwise be drawn. The cricket field is usually circular or oval in shape, with a rectangular pitch at the centre. The edge of the playing field is marked with a boundary, which could be a fence, part of the stands, a rope or a painted line. At each end of the pitch is a wooden target called a wicket; the two wickets are placed 22 yards (20 m) apart. The pitch is marked with painted lines: a bowling crease in line with the wicket, and a batting or popping crease four feet (122 cm) in front of it. The wicket is made of three vertical stumps supporting two small horizontal bails. A wicket is put down if at least one bail is dislodged, or one stump is knocked down (usually by the ball, but also if the batsman does it with his body, clothing or equipment). This is also described as breaking, knocking down, or hitting the wicket – though if the ball hits the wicket but does not dislodge a bail or stump then it is not considered to be down. At any instant each batsman "owns" a particular wicket (usually the one closer to him) and, except when actually batting, is safe when he is in his ground. This means that at least one part of his body or bat is touching the ground behind the popping crease. If his wicket is put down while the ball is live and he is out of his ground then he is dismissed, but the other batsman is safe. The fielding team's other nine members stand outside the pitch, spread out across the field. The fielding captain often tactically changes their position between balls. The bowler usually retreats a few yards (metres) behind the wicket, runs towards it (his run-up), and then releases the ball over-hand as he reaches the bowling crease. (If he crosses the crease before he releases the ball, or if he flexes his elbow too much in a throw, then it is a no ball, the batsman cannot be dismissed, and the batting team gets a penalty or extra run. If the ball passes the far wicket out of reach of the batsman then it is called a wide, also with an extra run.) The ball can be bowled so that it bounces on the pitch, lands exactly on the crease (a yorker), or crosses the crease without bouncing (a full toss). A no ball or a wide does not count towards the six balls in the over. If the batsman hits the ball but it is caught by a fielder without bouncing then he is caught out. If it is caught by the bowler then he is caught and bowled; by the wicket keeper, caught behind. If the batsman is successful in striking the ball and it is not caught without bouncing, then the two batsmen may try to score points (runs) for their team. Both batsmen run the length of the pitch, exchanging positions, and grounding their bats behind the opposite crease. Each crossing and grounding by both batsmen is worth one run. The batsmen may attempt one run, or multiple runs, or elect not to run at all. By attempting runs, the batsmen risk dismissal. This happens if the fielding team retrieves the ball and hits either wicket with the ball (either by throwing it, or while holding it) before the batsman who owns that wicket reaches his ground behind the crease. The dismissed batsman is run out. Batsmen will sometimes start to run, change their minds, and return to their original positions. If the batsman hits the ball over the field boundary without the ball touching the field, the batting team scores six runs. If the ball touches the ground and then reaches the boundary, the batting team scores four runs. The batsmen might have started running before the ball reaches the boundary, but those runs do not count. If the striking batsman leaves his ground and misses the ball, then the wicket keeper can catch it and put down the wicket – out stumped. A dismissed batsman leaves the field, to be replaced by another batsman from the batting team. However, even though the wicket may have been put down, or the ball caught, the batsman is not actually dismissed until the fielding team appeal to the umpires for a decision, traditionally using the expression "How's that" (or "Howzat") (although often the batsman will immediately walk away without the need for an appeal). In some matches, particularly Test matches, either team may request a review by a third umpire who can use a decision review system (DRS), which includes TV replays and other electronic equipment such as Hawk-Eye, Hot Spot and the Snickometer. After a bowler has bowled six times (an over), another member of the fielding team is designated as the new bowler, the old bowler taking up a fielding position. The batsmen stay in place, and the new bowler bowls to the opposite wicket, so the roles of striker and non-striker reverse. The wicket keeper and the two umpires always change positions, as do many of the fielders, and play continues. Bowlers may (and usually do) bowl multiple times during an innings, but may not bowl two overs in succession. The number of innings and the number of overs per innings vary depending on the format of the match. In a match which is not a limited overs format the umpires will often specify that the last session of the day will have a specified number of overs rather than continuing until a specified time (to avoid time wasting by either team). The match ends when all innings have been completed. The umpires can also call an end to the match in case of bad light or weather. But often the match ends immediately when one team to bat has completed its innings or both its innings, and the other team already has more runs. In four-innings games the last team may not even need to play its second innings: this team is said to win by an innings. If the winning team has not completed its last innings, and still has, for example, five batsmen who are not out or have not even batted, then they are said to "win by five wickets". If the last team to bat is all out and loses the match because it has say 50 fewer runs than the other team, then the winning team "wins by 50 runs". In the rare event that the two teams both complete their innings and they have the same number of runs, then it is a tie. In matches which are not limited overs there is also the possibility of a draw: the team with fewer runs still has batsmen on the field when the game ends, usually because time has run out. This has an impact on strategy: a team will often declare their innings closed when they have accumulated enough runs, in the hope that they will have enough time left to dismiss the other team and thus avoid a draw, but risking a loss if the other team scores enough runs. ii) A used red ball, Red balls are used in Test cricket and first-class cricket and some other forms of cricket (right). The ball is a hard leather-seamed spheroid, with a circumference of 9 inches (230 mm). The hardness of the ball, which can be delivered at speeds of more than 90 miles per hour (140 km/h), is a matter for concern and batsmen wear protective clothing including pads (designed to protect the knees and shins), batting gloves for the hands, a helmet for the head and a box inside the trousers (to protect the crotch area). Some batsmen wear additional padding inside their shirts and trousers such as thigh pads, arm pads, rib protectors and shoulder pads. The ball has a "seam": six rows of stitches attaching the leather shell of the ball to the string and cork interior. The seam on a new ball is prominent, and helps the bowler propel it in a less predictable manner. During cricket matches, the quality of the ball deteriorates to a point where it is no longer usable, and during the course of this deterioration its behaviour in flight will change and thus influence the match. Players will therefore attempt to modify the ball's behaviour by modifying its physical properties. Polishing the ball and wetting it with sweat or saliva is legal, even when the polishing is deliberately done on one side only to increase the ball's swing, while rubbing other substances into the ball, scratching the surface or picking at the seam is illegal ball tampering. The innings (ending with 's' in both singular and plural form) is the term used for the collective performance of the batting side. Sometimes all eleven members of the batting side take a turn to bat but, for various reasons, an innings can end before they have all done so. Depending on the type of match being played, each team has either one or two innings. The main aim of the bowler, supported by his fielders, is to dismiss the batsman. A batsman when dismissed is said to be "out" and that means he must leave the field of play and be replaced by the next batsman on his team. When ten batsmen have been dismissed (i.e. are out), then the whole team is dismissed and the innings is over. The last batsman, the one who has not been dismissed, is not allowed to continue alone as there must always be two batsmen "in". This batsman is termed "not out". The bowler bowls the ball in sets of six deliveries (or "balls") and each set of six balls is called an over. This name came about because the umpire calls "Over!" when six balls have been bowled. At this point, another bowler is deployed at the other end, and the fielding side changes ends while the batsmen do not. 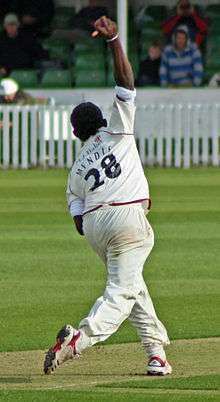 A bowler cannot bowl two successive overs, although a bowler can (and usually does) bowl alternate overs, from the same end, for several overs. The batsmen do not change ends at the end of the over, and so the one who was non-striker is now the striker and vice versa. (Sometimes when one of the two batsmen is a much stronger player than the other, he tries to score a single run from the last ball of the over so that he can remain "on strike".) The umpires also change positions so that the one who was at square leg now stands behind the wicket at the non-striker's end and vice versa. The fastest bowlers can deliver the ball at a speed of over 90 miles per hour (140 km/h) and they sometimes rely on sheer speed to try and defeat the batsman, who is forced to react very quickly. Other fast bowlers rely on a mixture of speed and guile. Some fast bowlers make use of the seam of the ball so that it "curves" or "swings" in flight. This type of delivery can deceive a batsman into mistiming his shot so that the ball just touches the edge of the bat and can then be "caught behind" by the wicketkeeper or a slip fielder. All eleven players on the fielding side take the field together. One of them is the wicket-keeper (or "keeper") who operates behind the wicket being defended by the batsman on strike. Wicket-keeping is normally a specialist occupation and his primary job is to gather deliveries that the batsman does not hit, so that the batsmen cannot run byes. He wears special gloves (he is the only fielder allowed to do so), a box over the groin, and pads to cover his lower legs. He is the only player who can get a batsman out stumped. Apart from the one currently bowling, the other nine fielders are tactically deployed by the team captain in chosen positions around the field. In all forms of cricket, if a fielder is injured or becomes ill during a match, a substitute is allowed to field instead of him. The substitute cannot bowl, act as a captain or keep wicket. The substitute leaves the field when the injured player is fit to return. Batsmen come in to bat in a batting order, decided by the team captain usually after consulting the team coach, though the captain is not bound to consult the coach. The first two batsmen – the "openers" – usually face the hostile bowling from fresh fast bowlers with a new ball. The top batting positions are usually given to the most competent batsmen in the team, and the team's bowlers – who are typically, but not always, less skilled as batsmen – typically bat last. The pre-announced batting order is not mandatory; when a wicket falls any player who has not yet batted may be sent in next. A batsman is not required to play a shot; in the event that he believes the ball will not hit his wicket and there is no opportunity to score runs, he can "leave" the ball to go through to the wicketkeeper. Equally, he does not have to attempt a run when he hits the ball with his bat. He can deliberately use his leg to block the ball and thereby "pad it away", but this is risky because of the leg before wicket rule. In the event of an injured batsman being fit to bat but not to run, the umpires and the fielding captain could previously allow another member of the batting side to be a runner. The runner's only task was to run between the wickets instead of the incapacitated batsman, and he was required to wear and carry exactly the same equipment as the batsman. As of 2011 the ICC outlawed the use of runners as they felt this was being abused. Indian cricketer Sachin Tendulkar is the only player to complete more than 30,000 runs in international cricket. Photo shows him making a shot to reach 14,000 runs in Tests. He was batting against Australia in 2010. The batsman on strike (i.e. the "striker") must prevent the ball hitting the wicket, and try to score runs by hitting the ball with his bat so that he and his partner have time to run from one end of the pitch to the other before the fielding side can return the ball. To register a run, both runners must touch the ground behind the crease with either their bats or their bodies (the batsmen carry their bats as they run). Each completed run increments the score. More than one run can be scored from a single hit: hits worth one to three runs are common, but the size of the field is such that it is usually difficult to run four or more. To compensate for this, hits that reach the boundary of the field are automatically awarded four runs if the ball touches the ground en route to the boundary or six runs if the ball clears the boundary without touching the ground within the boundary. In these cases the batsmen do not need to run. 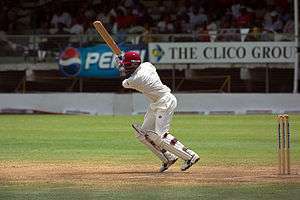 Brian Lara of the West Indies holds the record for highest score in an innings for both Test and first-class cricket. Running is a calculated risk because if a fielder breaks the wicket with the ball while the nearest batsman is out of his ground (i.e. he does not have part of his body or bat in contact with the ground behind the popping crease), the batsman is run out. There are eleven ways in which a batsman can be dismissed: five relatively common and six extremely rare. The common forms of dismissal are "bowled", "caught", "leg before wicket" (lbw), "run out", and (somewhat less common) "stumped". Rare methods are "hit wicket", "hit the ball twice", "obstructed the field", "handled the ball" and "timed out" – these are almost unknown in the professional game. The eleventh – retired out – is not treated as an on-field dismissal but rather a retrospective one for which no fielder is credited. Bowled: the bowler has hit the wicket with the delivery and the wicket has "broken" with at least one bail being dislodged (if the ball hits the wicket without dislodging a bail it is not out). 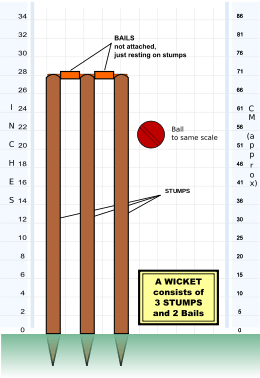 Leg before wicket (lbw): the ball has hit the batsman's body (including his clothing, pads etc. but not the bat, nor a hand holding the bat) when it would have gone on to hit the stumps. This rule exists mainly to prevent the batsman from guarding his wicket with his legs instead of the bat. To be given out lbw, the ball must not bounce outside leg stump or strike the batsmen outside the line of leg-stump. It may bounce outside off-stump. The batsman may only be dismissed lbw by a ball striking him outside the line of off-stump if he has not made a genuine attempt to play the ball with his bat. Run out: a member of the fielding side has broken or "put down" the wicket with the ball while the nearest batsman was out of his ground; this occurs either by an accurate throw to the wicket, or more commonly by a throw to the wicketkeeper or other fielder standing near the wicket, while the batsmen are attempting a run, although a batsman can be given out "run out" even when he is not attempting a run; he merely needs to be out of his ground. Stumped is similar except that it is done by the wicketkeeper after the batsman has missed the bowled ball and has stepped out of his ground, and is not attempting a run. A batsman can be run out on a No ball, but cannot be stumped. Timed out; means that the next batsman was not ready to receive a delivery within three minutes of the previous one being dismissed. Retired out: a batsman retires without the umpire's permission, and does not have the permission of the opposition captain to resume their innings. A batsman may leave the field without being dismissed. If injured or taken ill the batsman may temporarily retire, and be replaced by the next batsman. This is recorded as retired hurt or retired ill. The retiring batsman is not out, and may resume the innings later if he recovers. An unimpaired batsman may retire, and this is treated as being dismissed retired out; no player is credited with the dismissal. Batsmen cannot be out bowled, caught, leg before wicket, stumped or hit wicket off a no ball. They cannot be out bowled, caught, leg before wicket, or hit the ball twice off a wide. Some of these modes of dismissal can occur without the bowler bowling a delivery. The batsman who is not on strike may be run out by the bowler if he leaves his crease before the bowler bowls, and a batsman can be out obstructing the field or retired out at any time. Timed out is, by its nature, a dismissal without a delivery. With all other modes of dismissal, only one batsman can be dismissed per ball bowled. For a team sport, cricket places individual players under unusual scrutiny and pressure. Bowler, batsman, and fielder all act essentially independently of each other. While team managements can signal to a bowler or batsman to pursue certain tactics, the execution of the play itself is a series of solitary acts. Cricket is more similar to baseball than many other team sports in this regard: while the individual focus in cricket is slightly mitigated by the importance of the batting partnership and the practicalities of running, it is enhanced by the fact that a batsman's innings may continue for several hours. Cricket is a unique game where in addition to the laws, the players must abide by the "Spirit of the Game". The standard of sportsmanship has historically been considered so high that the phrase "it's just not cricket" was coined in the 19th century to describe unfair or underhanded behaviour in any walk of life. In the last few decades though, with financial incentives, high-level cricket has become increasingly fast-paced and competitive, increasing the use of appealing and sledging, although players are still expected to abide by the umpires' rulings without argument, and for the most part they do. Beginning in 2001, the MCC has held an annual lecture named after Colin Cowdrey on the spirit of the game. Even in the modern game fielders are known to signal to the umpire that a boundary was hit, despite what could have been considered a spectacular save (though sometimes they might be found out by the TV replays anyway). In addition to this, some batsmen have been known to "walk" when they think they are out even if the umpire does not declare them out. This is a high level of sportsmanship, as sometimes a batsman could take advantage of incorrect umpiring decisions. Cricket is a sport played predominantly in the drier periods of the year. But, even so, the weather is a key factor in many cricket matches. Cricket cannot be played in wet weather. Dampness affects the bounce of the ball on the wicket and is a risk to all players involved in the game. Many grounds have facilities to cover the cricket pitch (or the wicket). Covers can be in the form of tarpaulins laid over the wicket, elevated covers on wheels (acting like an umbrella) or even hover covers which form an airtight seal around the wicket. However, most grounds do not have the facilities to cover the outfield. This means that in the event of heavy rain, a match may be cancelled, abandoned or suspended due to an unsafe outfield. Another factor in cricket is the amount of light available. At grounds without floodlights (or in game formats which disallow the use of floodlights), umpires can stop play in the event of bad light as it becomes too difficult for the batsmen (and in extreme cases, fielders) to see the ball coming at them. The sight-screens give a white background which help batsmen pick out the red ball (or a black background for a white ball). Unlike those of most sports, cricket playing fields can vary significantly in size and shape. While the dimensions of the pitch and infield are specifically regulated, the Laws of Cricket do not specify the size or shape of the field. The field boundaries are sometimes painted and sometimes marked by a rope. Pitch and outfield variations can have a significant effect on how balls behave and are fielded as well as on batting. Pitches vary in consistency, and thus in the amount of bounce, spin, and seam movement available to the bowler. Hard pitches are usually good to bat on because of high but even bounce. Dry pitches tend to deteriorate for batting as cracks often appear, and when this happens to the pitch, spinners can play a key role. Damp pitches, or pitches covered in grass (termed "green" pitches), allow good fast bowlers to extract extra bounce. Such pitches tend to offer help to fast bowlers throughout the match, but become better for batting as the game goes on. While players of other outdoor sports deal with similar variations of field surface and stadium covering, the size and shape of their fields are much more standardised. Other local factors, such as altitude and climate, can also significantly affect play. These physical variations create a distinctive set of playing conditions at each ground. 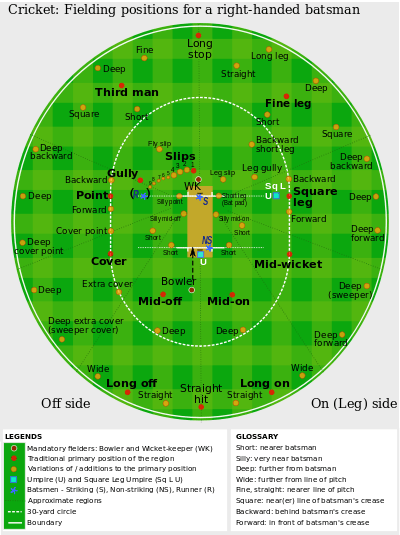 A given ground may acquire a reputation as batsman friendly or bowler friendly if one or the other discipline notably benefits from its unique mix of elements. The absence of a standardised field affects not only how particular games play out, but the nature of team makeup and players' statistical records. Cricket is a multi-faceted sport with multiple formats, varying playing standard and level of formality and the desired time that the match should last. A pertinent division in terms of professional cricket is between matches limited by time in which the teams have two innings apiece, and those limited by number of overs, in which they have a single innings each. 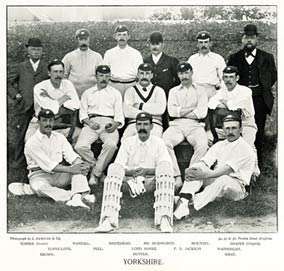 The former, known as first-class cricket, has a duration of three to five days (there have been examples of "timeless" matches too); the latter, known as limited overs cricket because each team bowls a limit of typically 50 or 20 overs, has a planned duration of one day only (a match can be extended if necessary due to bad weather, etc.). Historically, a form of cricket known as single wicket had been extremely successful and many of these contests in the 18th and 19th centuries qualify as important matches. In this form, although each team may have from one to six players, there is only one batsman at a time and he must face every delivery bowled while his innings lasts. Single wicket has rarely been played since limited overs cricket began. Standard limited overs cricket was introduced in England in the 1963 season in the form of a knockout cup contested by the first-class county clubs. In 1969, a national league competition was established. The concept was gradually introduced to the other leading cricket countries and the first limited overs international was played in 1971. In 1975, the first Cricket World Cup took place in England. Limited overs cricket has seen various innovations including the use of multi-coloured kit and floodlit matches using a white ball. A "one day match", named so because each match is scheduled for completion in a single day, is the common form of limited overs cricket played on an international level. In practice, matches sometimes continue on a second day if they have been interrupted or postponed by bad weather. The main objective of a limited overs match is to produce a definite result and so a conventional draw is not possible, but matches can be undecided if the scores are tied or if bad weather prevents a result. Each team plays one innings only and faces a limited number of overs, usually a maximum of 50. The Cricket World Cup is held in one day format and the last World Cup in 2015 was won by the co-hosts, Australia. The next World Cup will be hosted by England and Wales in 2019. Twenty20 is a new variant of limited overs itself with the purpose being to complete the match within about three hours, usually in an evening session. The original idea, when the concept was introduced in England in 2003, was to provide workers with an evening entertainment. It was commercially successful and has been adopted internationally. The inaugural Twenty20 World Championship was held in 2007 and won by India. 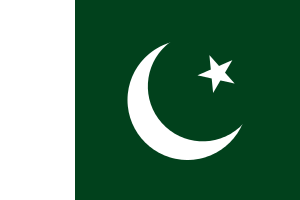 Subsequent events have been held which were won by Pakistan (2009), England (2010), West Indies (2012), and Sri Lanka (2014). The next tournament is scheduled to be held in 2016. After the inaugural ICC World Twenty20 many domestic Twenty20 leagues were born. First of them was Indian Cricket League which was a rebel league since it was not authorized by BCCI. BCCI then formed its official league called the Indian Premier League. The official league went on to become a successful annual affair that attracted players and audience around the globe, while the Indian Cricket League has been disbanded. After the success of Indian Premier League, many other domestic leagues were formed globally. Recently the Twenty20 Champions League was formed as a tournament for domestic clubs of various countries. In this league, competition is between the top domestic teams from the senior cricketing nations. Many leagues have been formed around the world of varying degrees of professionalism, the oldest being the Birmingham & District Premier League in the Birmingham area of England, founded in 1888. The ICC has 104 members: 10 Full Members that play official Test matches, 34 Associate Members, and 60 Affiliate Members. The ICC is responsible for the organisation and governance of cricket's major international tournaments, notably the Cricket World Cup. It also appoints the umpires and referees that officiate at all sanctioned Test matches, One Day International and Twenty20 Internationals. 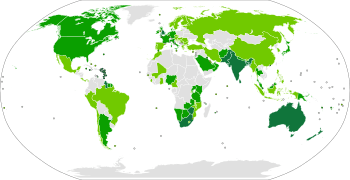 Each nation has a national cricket board which regulates cricket matches played in its country. The cricket board also selects the national squad and organises home and away tours for the national team. In the West Indies these matters are addressed by the West Indies Cricket Board which consists of members appointed by four national boards and two multi-national boards. AResigned May 1961, readmitted 10 July 1991. Cricket was played as part of the 1900 Summer Olympics, when England and France contested a two-day match. In 1998, cricket was played as part of the Commonwealth Games, on this occasion in the 50-over format. Twenty20 cricket was under consideration to be part of the 2010 Commonwealth Games, which were held in Delhi, but at the time the Board of Control for Cricket in India (BCCI), were not in favour of the short format of the game, and it was not included. Cricket was played in 2010 Asian Games in Guangzhou, China and 2014 Asian Games in Incheon, South Korea. India skipped both times. There was further calls for subsequent Commonwealth Games and Olympic Games. The Commonwealth Games Federation asked the ICC to participate in the 2014 and 2018 Commonwealth Games, but the ICC turned down the invitation. In 2010, the International Olympic Committee recognised cricket as a sport which could apply to be included in the Olympic Games, but in 2013 the ICC announced that it had no intentions to make such an application, primarily due to opposition from the BCCI. 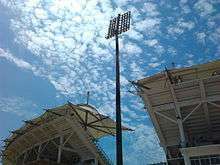 ESPNcricinfo suggested that the opposition might be based on the possible loss of income. In April 2016, ICC chief executive Dave Richardson said that Twenty20 cricket can have a chance of getting in for the 2024 Summer Games, but there must be collective support shown by the ICC's membership base, in particular from BCCI, in order for there to be a chance of inclusion. Cricket is the subject of works by noted English poets, including William Blake and Lord Byron. Beyond a Boundary (1963), written by Trinidadian C.L.R. James, is often named the best book on any sport, ever written. In fiction, there is English author P. G. Wodehouse's 1909 novel, Mike. In the visual arts, notable cricket paintings include Albert Chevallier Tayler's Kent vs Lancashire at Canterbury (1907) and Russell Drysdale's The Cricketers (1948), which has been called "possibly the most famous Australian painting of the 20th century." French impressionist Camille Pissarro painted cricket on a visit to England in the 1890s. Francis Bacon, an avid cricket fan, captured a batsman in motion. Caribbean artist Wendy Nanan's cricket images are featured in a limited edition first day cover for Royal Mail's "World of Invention" stamp issue, celebrating the London Cricket Conference 1–3 March 2007, first international workshop of its kind and part of the celebrations leading up to the 2007 Cricket World Cup. There are many cricket video games, including EA Sports Cricket 07. In the late 19th century, a former cricket player, English-born Henry Chadwick of Brooklyn, New York, was responsible for the "development of the box score, tabular standings, the annual baseball guide, the batting average, and most of the common statistics and tables used to describe baseball". The statistical record is so central to the game's "historical essence" that Chadwick came to be known as Father of Baseball, and was an early inductee in the Baseball Hall of Fame. ↑ "John Leach, From Lads to Lord's". Archived from the original on 29 June 2011. Retrieved 31 January 2009. CS1 maint: Unfit url (link) quotes the precise date of the court case in Guildford as Monday, 17 January 1597 (Julian date), which is in the Gregorian year of 1598. Retrieved 31 January 2009. 1 2 3 Birley, p. 3. 1 2 3 Altham, p. 21. ↑ Terry, David (2008). "The Seventeenth Century Game of Cricket: A Reconstruction of the Game" (PDF). SportsLibrary. Retrieved 2 May 2016. ↑ The Australian Eleven: The first Australian team, National Museum of Australia. Retrieved 30 December 2014. 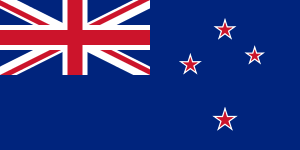 ↑ MCC – Laws of Cricket: Law 1 Archived 11 March 2013 at the Wayback Machine. Retrieved 25 July 2009. ↑ Eastaway, Rob (2004). What Is a Googly? : The Mysteries of Cricket Explained. Great Britain: Robson Works. p. 24. ISBN 1-86105-629-X. 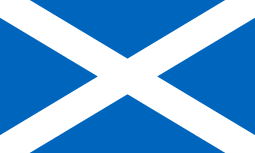 ↑ "Law 28 (the wicket is down)". Laws of Cricket. Marylebone Cricket Club. Retrieved 11 November 2015. ↑ MCC – Laws of Cricket: Law 23. Retrieved 25 July 2009. 1 2 "Dimensions for Cricket". Retrieved 16 February 2010. 1 2 "Law 19 (Boundaries)". Marylebone Cricket Club. ↑ Cricket can also be played on artificial surfaces, notably matting. ↑ MCC – Laws of Cricket: Law 12. Retrieved 25 July 2009. ↑ "Fastest delivery of a cricket ball (male)". Guinness World Records. Retrieved 2015-06-23. ↑ "Runner rule was being abused, says ICC". espn cricinfo. Retrieved 28 May 2013. ↑ MCC – Laws of Cricket: Law 30. Retrieved 25 July 2009. ↑ MCC – Laws of Cricket: Law 32. Retrieved 25 July 2009. ↑ MCC – Laws of Cricket: Law 36. Retrieved 25 July 2009. ↑ MCC – Laws of Cricket: Law 38. Retrieved 25 July 2009. ↑ MCC – Laws of Cricket: Law 39. Retrieved 25 July 2009. ↑ MCC – Laws of Cricket: Law 35. Retrieved 25 July 2009. ↑ MCC – Laws of Cricket: Law 34. Retrieved 25 July 2009. ↑ MCC – Laws of Cricket: Law 37. Retrieved 25 July 2009. ↑ MCC – Laws of Cricket: Law 33. Retrieved 25 July 2009. ↑ MCC – Laws of Cricket: Law 31 Archived 11 February 2006 at the Wayback Machine.. Retrieved 25 July 2009. ↑ MCC – Laws of Cricket: Law 2. Retrieved 18 October 2015. ↑ MCC – Laws of Cricket: Preamble to the Laws Archived 6 November 2011 at the Wayback Machine.. Accessed 8 September 2010. ↑ MCC – Laws of Cricket: Promoting the Spirit of Cricket. Accessed 26 March 2012. ↑ "Zimbabwe revokes Test status". BBC Sport. 18 January 2006. Retrieved 6 November 2011. 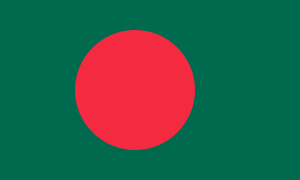 ↑ "Zimbabwe beat Bangladesh on return to Test cricket". BBC Sport. 8 August 2011. Retrieved 6 November 2011. ↑ Eastaway, Rob, What Is a Googly? : The Mysteries of Cricket Explained (Anova, 2005), p. 134. ↑ "Shorter, simpler, sillier" in ESPNcricinfo, 7 September 2007. ↑ CricketArchive: full list of ICC members. Retrieved 25 July 2009. 1 2 3 4 5 6 7 "A brief history ...". Cricinfo. Retrieved 2 May 2008. ↑ "ICC Rankings". International Cricket Council. 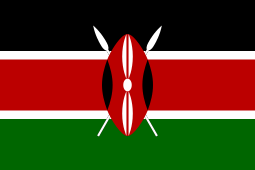 ICC Development (International) Limited. Retrieved 9 February 2016. 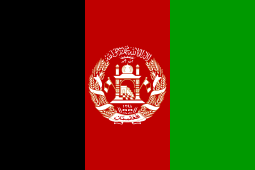 ↑ "Cricinfo-Other countries-Teams-Afghanistan". Cricinfo. Retrieved 4 May 2008. ↑ Buchanan, Ian (1993). Mallon, Bill, ed. "Cricket at the 1900 Games" (PDF). Journal of Olympic History. International Society of Olympic Historians. 1 (2): 4. ↑ "Cricket unlikely at 2010 Games". ESPNcricinfo. 23 January 2006. Retrieved 3 February 2015. 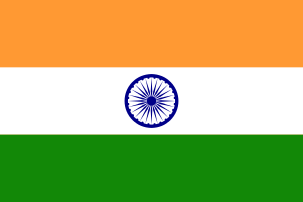 ↑ "India to skip Asian Games again in 2014". ↑ "ICC rejects 2018 offer, cricket stays out of Commonwealth Games". Reuters. 24 July 2014. Retrieved 3 February 2015. ↑ "Cricket gets Olympic approval". ESPNcricinfo. 12 February 2010. Retrieved 3 February 2015. ↑ Qaiser Mohammad Ali (1 July 2013). "BCCI rejects plans to make cricket an Olympic sport due to 'conflict'". Daily Mail. London. Retrieved 3 February 2015. ↑ "ICC's chief executive David Richardson wants to expand World T20 first round to 18 teams, have Super 12 phase". 1 2 Mortimer, Gavin (6 June 2013). A History of Cricket in 100 Objects. Serpent's Tail. pp. 76–77. ISBN 1846689406. ↑ Fletcher, Jeff (June 1999). Collins Gem Cricket. HarperCollins. p. 234. ISBN 0004723406. ↑ Singh, Vikas (30 December 2003). "Ponting in Bradmanesque avatar". The Times of India. Retrieved 8 September 2010. 1 2 3 Smart, Alastair (20 July 2013). "The art of cricket: Enough to leave you stumped", The Telegraph. Retrieved 12 March 2016. ↑ Meacham, Steve (6 June 2009). "Montmartre, with eucalypts". Sydney Morning Herald. Fairfax. Retrieved 2009-08-31. ↑ "BBC NEWS - In pictures: Caribbean cricket art, In the middle". Retrieved 11 June 2016. ↑ Blainey, Geoffrey (2010). A Game of Our Own: The Origins of Australian Football. Black Inc. p. 186. ISBN 1-86395-347-7. ↑ de Moore, Greg (2008). Tom Wills: His Spectacular Rise and Tragic Fall. Allen & Unwin. pp. 77, 93–94. ISBN 978-1-74175-499-5. 1 2 Tygiel, Jules (2000). Past Time: Baseball as History. Oxford University Press. p. 16. ISBN 0195089588.